This post will show how to deploy a Window Server 2016 Active Directory to an existing Windows Server 2012 R2 Domain and upgrade to Windows Server 2016 Active Directory. In my lab environment, lab.jdeployment.com, I have an existing Windows Server 2012 R2 Active Directory Domain Controller named DC02 and will deploy Window Server 2016 server SVR2016-02 and promote it as Domain Controller. The Current FSMO Role on the Windows Server 2012 R2 Domain Controller, which we will change later after deploying the Windows Server 2016 Domain Controller. – Configured the Network Settings of SVR2016-02 point to DC02 as its DNS and make sure the dc02 can be pinged. – Installed the latest update to SVR2016-02. After installing the AD DS role, we need to configure the server as a domain controller using a separate wizard within Server Manager. (see that yellow triangle? – click on that). So in the Deployment Configuration page select the Add a domain controller to an existing domain radio button and specify the existing domain. Once all the prerequisite checks passed successfully, go ahead and click on the Install button. In the Windows Server 2016 Domain Controller, launch the Active Directory Users and Computers console. Right click on the domain and select Operations Masters in the menu. In the Operations Masters window, in the RID tab, lets change it to SVR2016-02, click on the Change button. Click the Yes button when asked about transferring the operations master role. Once the operations master role has successfully transferred, click OK to continue and make sure that the Operations Master box now shows SVR2016-02.lab.jdeployment.com (Windows Server 2016). PDC has been changed to the SVR2016-02. Infrastructure has been changed to the SVR2016-02. Close the Active Directory Users and Computers console when done. Next we’ll transfer the Domain naming master, launch the Active Directory Domains and Trusts. In the console, click Active Directory Domains and Trusts and in the sub menu, select Operations Manager. 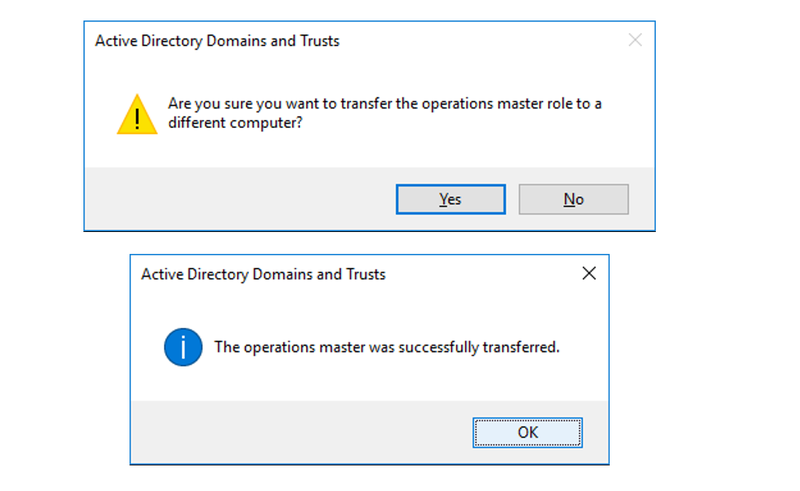 In the Operations Master window, click the Change button to transfer the domain naming master role to the Windows Server 2016. When asked if you “Are sure you wish to transfer the operations master role to a different computer” and click Yes. After “The operations master is successfully transferred.”, click OK.
Verify that the Domain naming operations master is the 2016 Server. The last role to be transferred is the Schema Master. First, open a command prompt in administration view on the Windows Server 2016. On the command prompt window, type in regsvr32 schmmgmt.dll and hit enter key. Once completed successfully, click on OK button to close the RegSvr32 window then close the command prompt. In the Add or Remove Snap-ins window, select Active Directory Schema and click the Add >button. Click OK to continue. In the MMC, right click Active Directory Schema and select Change Active Directory Domain Controller…, in the menu. Select the Windows Server 2016 and click OK.
Back in the console, select and right click Active Directory Schema and select Operations Master… in the menu. In the Change Schema Master window, click Change to transfer the schema master role to the Windows Server 2016. When prompt if you are sure you wish to transfer the schema master role to a different computer, click Yes. Verify that SVR2016-02 is now the current schema master. Now to verify that we’ve completed the transfer of all the FSMO roles to Windows Server 2016 Active Directory, launch a command prompt and type netdom query FSMO and hit enter. Verify that all the operations masters are in the Windows Server 2016 (SVR2016-02.lab.jdeployment.com). We have now, successfully upgraded the Active Directory to Windows Server 2016. For details, including important caveats and limitations on upgrade, license conversion between editions of Windows Server 2016, and conversion of evaluation editions to retail, see Supported Upgrade Paths for Windows Server 2016.
thank you very much for your instructions. The KB is fantastic and well explained. I have a question. My environment is purely VMware. But after i transfer all the FSMO roles and etc stuff, can i reassign the IP of server 2016 DC to 192.168.1.100 and keep the same IP as DNS ?